This mod requires LazyLib to function! Trying to calculate direction using vanilla's system of icons around the edge of a rectangular screen can be frustrating, and forget about judging relative positions at a glance. Tired of being forced to constantly check the tactical map to obtain basic situational awareness? Ever wish that Starsector would just include a normal radar view? Then this mod is for you. It does exactly as its name implies: adds a more familiar circular radar view to your combat HUD to make keeping track of the battle map on the fly much easier. It also includes an easily-parsed combat readiness meter for the piloted ship as well as a simple overview of how the battle is going for your side. The radar's zoom level can be changed using +/- and toggled with K, and has three zoom levels by default. These options can be changed by modifying the .json files in data/config/radar/, along with other settings such as UI/contact colors, radar sight radius, etc. The radar should work with any other mod on the forum and doesn't require a new game. As the radar is display-only and doesn't change anything in your game, you can deactivate this mod at will. Zoom level is shown as four small white lines perpendicular to the cardinal directions. How close they are to the radar's center depends on the current zoom level. Zoom is controlled with K.
Ships are drawn as polygons. 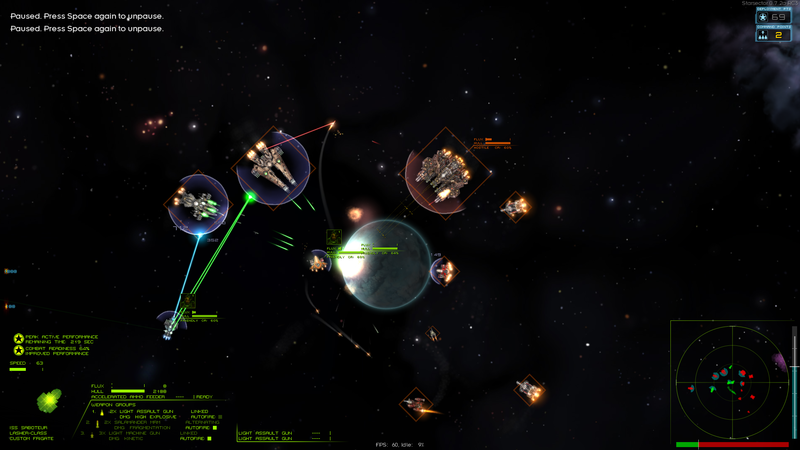 Phased ships will appear faded on the radar, and your ship's current target will have a white marker drawn around it. Shields will have their active arcs shown in blue. Missiles are small colored dots; red for enemy missiles, green for allied ones. The brightness of the dot varies based on how much damage that missile deals, so an Atropos torpedo (2,000 damage) is much more noticeable than an Annihilator swarm (200 damage each). Missiles that are locked onto the player ship are colored orange. Missiles that have burnt out are considered enemies as they can hit either side at that point. Missile lock status is displayed at the top left of the radar box. If any guided missiles are in view and locked onto the player ship, an orange missile icon will appear here. The brightness of this icon depends on the most threatening missile currently locked on. Asteroids are small white dots. Objectives are large hollow diamonds. Retreat areas are shaded yellow. Map borders are shown as red lines, with a gray void beyond to show inaccessible areas. 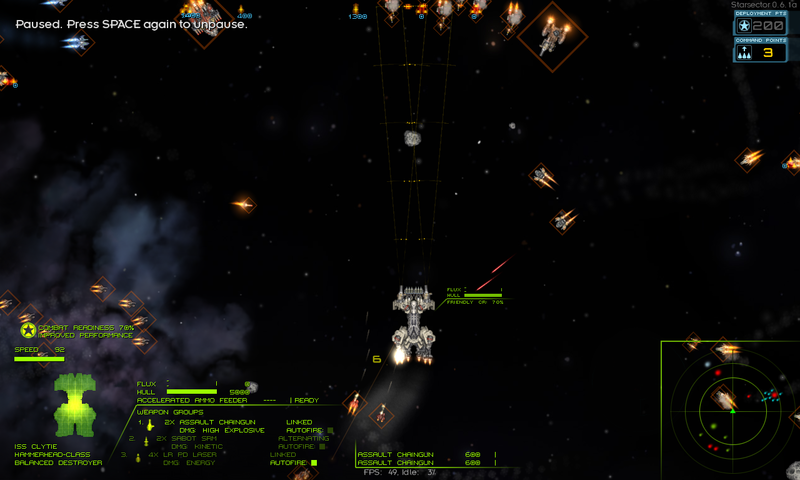 Combat readiness for the player ship is shown as a vertical bar to the right of the radar. Current CR is shown in cyan, CR lost in the current battle in dark blue, and unobtained CR in dark gray. The bar will slowly flash if you are currently losing CR and flash faster as malfunction risk rises. For ships that don't lose CR this bar will be faded to be less obtrusive. If you are playing in campaign, your ship's maximum CR given the current captain and crew is shown as a horizontal white line. Battle progress is shown as a bar along the bottom of the radar. It's based on fleet points remaining on each side, so the larger the green portion is, the closer to victory you are. A side's portion of the bar will flash if they are in full retreat. The relative fleet strengths at battle start is shown as a vertical white line so you can quickly tell if you're doing better than your opponent. Fleets are shown as narrow triangles pointing towards their current facing. Stations use the same station icon as the vanilla map tab. Jump points appear as a swirling purple portal. Planets are circles colored the same as their map icon. All colors listed above can be customized in the radar config files. Nebulae are not included in the radar view due to API limitations. Please let me know if you spot any issues, especially alongside other mods that use OpenGL such as ShaderLib. adds 10% of its diameter as padding to the side/below. - Removed "phasedShipAlphaMult" setting, added "minShipAlphaMult"
- New settings: "missileContactSize" and "flareContactSize"
change "simpleMode" to true in radar_settings.json under "shipRenderer"
"drawSolidShields" to false in radar_settings.json under "shipRenderer"
The campaign radar won't draw anything with the tag "radar_nodraw"
That's something I've wanted in this game for, like, ever. 1. A square presentation using the same colors as the UI would fit better visually. 2. I'd place it in the right corner, so that it's out of the way but isn't in a zone that's too busy with other information. 3. I'm sure a fair amount of the CPU time is spent on drawing the vector'd triangles. Perhaps not bothering, or depicting velocity by storing two update cycles-worth of past ship movement and drawing with less alpha (i.e., last update, 128, update 2, 64, so that it fades out and dynamically shows movement) using circle bitmaps might help save CPU while accomplishing the goal? The other big saver would be to not show every single Fighter, but merely a symbol for the group, centered on the leader, and Drones definitely don't need a complex presentation- moving dots are totally sufficient. A. A simple global that could be set / unset in a singleton; this would require minor touchup to the Dialog and Battle code (one-liners to set said value true false), not too scary but it'd require people to compile a .jar atm. B. Give users a key that can turn it on / off in any context. I originally tried this as a square box, but IMO rectangular radars are ugly. Definitely agree on matching the UI colors, though. Luckily that's pretty trivial to change. It's in the lower right due to the 'rendering over menus' issue. If I moved it to the top right it'd render over a lot of the tactical map's buttons. I wouldn't worry about the triangles, that'll be a non-issue once I optimize. That's next on my list! I meant squared up with the menu edge. As for the aesthetics, the rest of the UI is angular, so it's standing out. A box around it, perhaps, and fade the outer circles, something like this? Honestly this feature should become part of the main code, the current radar system...doesn't give quite a satisfactory amount of real time information. Are you able to have different size and different colour vectors as proposed by Xenoargh, that would be invaluable in larger battles. Damn useful indeed. I hope you'll also manage to implement the missiles detection into the radar too, i hate being surprised by Pilums lrm storms. Version 0.2 is up, get it here. Radar positioning is still a placeholder, but I moved the radar to the absolute lower right so it wouldn't overlap the UI when using a 1024x768 resolution. I upped the number of segments on the circles to make them look smoother. I also changed the colors to match what's set for the UI in settings.json ("textFriendColor" is used for the UI, "iconFriendColor"/"iconEnemyColor" for radar contacts). Finally, the mod should have significantly better performance in large battles as I reduced trig calls by 60% (I told you it needed optimization). Sorry about the lack of actual progress. I've been busy with holiday stuff. I actually added those methods after stumbling across a page that described drawing circles using a simple repeated rotation. At the time I didn't even know rendering in combat was possible and was planning on making a campaign-level radar. Yeah, the current positioning is just an arbitrary guess until I can spend the time getting it right. I don't think the combat UI is scaled, so once I measure the existing UI getting the radar to look good will be easy. I'm considering leaving a bit of extra space for potentially implementing this suggestion, though. Also, I really like that mock-up. You're right, with the darkened edges it matches the UI much better. Consider it added to the to-do list. Maybe as a toggleable option, though I personally prefer the triangles. The trick is including as much information as possible without it being an indecipherable mess, and blurred points take longer to mentally process than distinct shapes. Plus, I think in most battles knowing a ship's facing is more important than their current velocity. I'm planning on displaying ships (including phased status and a marker around your current target), missiles, asteroids, and maybe shield arcs. There will be a settings file to toggle these on/off. The toggle key is set in data/config/combat_radar.json and defaults to K. The keyboard codes for the config file can be found here. Merry Christmas Lazy Wizard. I guess you're right, it would likely be a bit overwhelming like that. What about different zoom scales? Or perhaps a 1-pixel border of a darker shade to give a higher contrast to each object? This is truly the work of the gods... oh wait, its lazywizard! Close enough. 'Sucuse my silliness, but all-in-all, nice work! You could call it the "LazyTweaks" mod if you combine it with other non-combat focused mods in the future. Just sayin'. First of all Happy Christmas for you guys,. Second, isnt it possible using the ships bounds to create a shape of the ship instead of a triangle shape? Huh, I've never thought about that. Although as far as I know (which isn't much after only two weeks of OpenGL experience), concave polygons need to be broken up into multiple convex polygons to be filled properly. That would make rendering slower/more difficult. Or maybe assign different shapes based on different hull types? I think the simplist way to render a 1-pixel border would be to have 2 triangles per object. The first triangle is the lighter colour, and the second triangle is the darker colour. Assuming it renders the first triangle above the second, you will achieve a border?